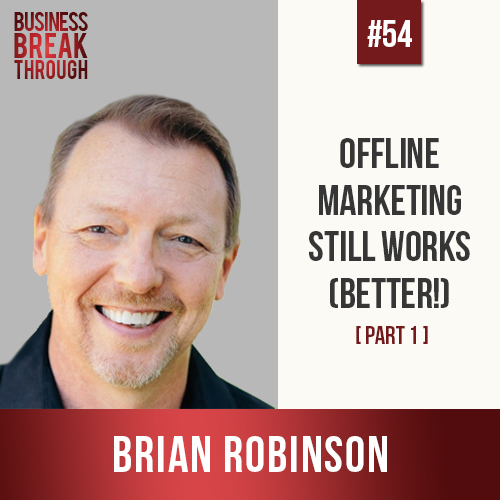 Brian Robinson is a sales and marketing expert, best-selling author and coach. He has worked in sales and marketing with some of the best-known companies in the world, including Coca-Cola USA and Johnson & Johnson. Upon leaving his corporate career, he helped launch a successful startup where he was the first person in the history of the industry to sell more than one million dollars in business in twelve months—entirely by phone. His over two-decades-worth of in-the-trenches, battle-tested face-to-face and phone-presentation knowledge can benefit virtually anyone, from Fortune 500 companies to entrepreneurial ventures. Brian is the author of the Amazon #1 Best-Seller, THE SELLING FORMULA: 5 Steps for Instant Sales Improvement. Brian and his wife Cindy reside in the Oklahoma City Area and have eight children – which could be the top of an entire podcast in and of itself! Started his career working for Coca Cola USA where he learned the basics of how to sell. Left after three and a half years to work for Johnson & Johnson, where he worked in four different divisions over 13 years. Was at an incredibly successful point where 90% of all potential customers were already using Johnson & Johnson products, when a friend offered him the opportunity to start a business selling on-hold messages to banks and credit unions. Decided that he would need to exert too much effort to sell to the last 10% of potential customers, and after four months of consideration, decided to join his friend. Brought the business to $1M in twelve months by cold calling bank managers to schedule appointments. Once he had a confirmed meeting, he would set out on the road and on the way, he would call other bank managers within an X-mile radius to set more appointments in that area. By the early 2000s was at a point where he was on the road three to four days a week, driving 1000-1500 miles, when his wife gave birth to twins (he already had six children), forcing him to get off the road. Switched to using mailings and pre-recorded messages to generate warm leads instead of driving the country to meet cold leads. Today Brian has expanded to selling on hold-messages, in-lobby digital signage (content for flat panel TVs in lobbies) and overhead music for the lobbies. He uses a range of different sales techniques including conferences and direct mailing campaigns using hand-written letters.